Less than 10 years ago, I would need almost 1400 of these to carry what now fits on my keyring. 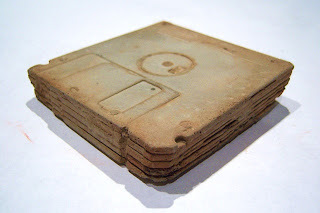 Repondicium antiquipotacium-(commonly referred to as the 3.5 inch floppy disc): "This particular species evolved fairly quickly from much larger ancestors. First seen in the mid 1980s, examples are rare, but by the mid 1990s, they became very abundant. They became very scarce and almost extinct by the early part of the next century. Some speculate the recordable compact disk had a hand in the demise of the Repondicium antiquipotacium." Visit www.heartlessmachine.com for more modern fossils. What extinct gadget do you actually miss? 30yrs ago we were using 5 1/4 inch floppies and even cassette tapes. Wow I really feel old now. BTW I was thinking this morning about how I can speak into my Iphone and ask for directions or Google something and wondering what’s next. It's scary when you think of how far we have come with technology. I think we are going to become like the humans in Wall-E and have computers and machines do everything for us. I really loved records! When my record player needle suddenly quit working, there were no more needles to buy, so all of my great records just got put into a box and forgotten. Sadness. CDs scratch too! And how are my boys supposed to listen to the most awesome Christmas album ever - Bugs and Daffy!